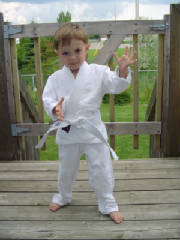 Aiki-Judo is an excellent martial art for young children to study. It is taught in a structured environment with clearly outlined rules of conduct and etiquette, making it easy for children to follow. Aiki-Judo teaches one of the most important physical skills anyone can learn – how to fall safely and without fear. Every person falls sometime in their life. Why not do it with confidence? Additionally, its techniques develop children’s balance, speed, agility, flexibility and overall fitness, which carry over into any other activity children care to try. Although fighting is frowned upon in Aiki-Judo, its techniques are very practical in schoolyard skirmishes where children may be forced to protect themselves. They send the message, ‘I can handle myself,’ without undue damage to your attacker.